Last night, the New York Jets selected the best quarterback in the draft. Read that twice if you have to — things are different this morning. Throughout what has been an intriguing, and largely unpredictable, draft process, the expectation that Sam Darnold would be off the board at No.3 endured as something of an isolated constant. Immediately after the 2017 Rose Bowl, in which Darnold lifted USC past Penn State in an exhilarating shoot-out, the Trojans’ passer emerged as the consensus No.1 pick for the 2018 draft. And until a little over 24 hours ago, Darnold’s status in that position endured almost uninterrupted. 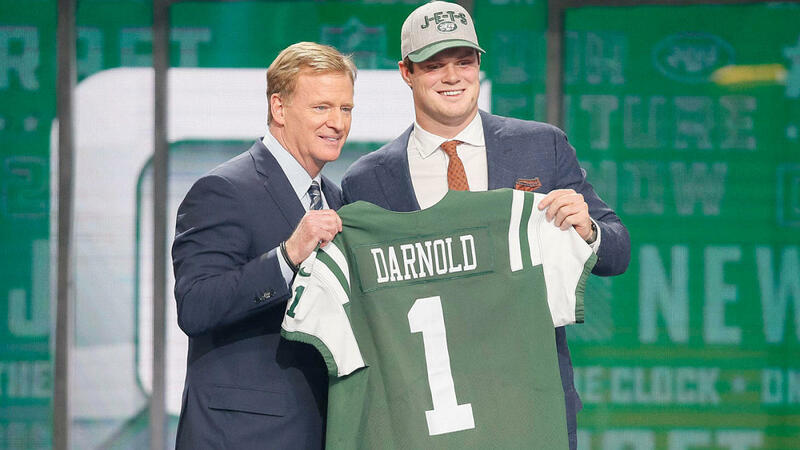 With quaterback-needy Cleveland picking first — and the soon-to-be quarterback-needy Giants picking at two — it was widely accepted that Darnold would be out of Mike Maccagnan’s reach at No.6, and then later at No.3. While some observers were willing to countenance the prospect of Darnold finding himself in New York, such thought experiments were conducted only in relation to the Football Giants. Indeed, the notion that the USC Trojan could begin next season in green and white existed only as a pipe dream for a handful of only the most optimistic Jets fans. It was widely theorized that if Cleveland was to commit the inexcusable blunder of passing on Darnold, he would surely be taken by the Giants, or their successor at the coveted number two spot. The Jets, meanwhile, would be forced to settle for Baker Mayfield or Josh Rosen. Two fine prospects, sure. But two prospects who nonetheless carry enough red flags between them to decorate Tiananmen Square. It will be conveniently forgotten, but the Jets’ move up to the third spot in the draft order was initially met with widespread criticism. “Jets-ian” was the catch-all descriptor for what was considered a hasty and ill-judged move. Where other franchises may have been granted the benefit of the doubt, the Jets were accused of moving up blindly in a desperate search for an answer at quarterback. A convincing narrative at the time, no doubt, but one that no longer stands up to scrutiny. For now, at least, Maccagnan has proved his doubters wrong, and in the process, has bought himself more time at the helm of the Jets. In hindsight, it seems clear that Maccagnan knew exactly what he was doing in trading places with Indianapolis. All along, the Giants had no intention of taking a QB or trading back down the order. Dave Gettleman wanted a guaranteed All Pro weapon on offense. Gettleman wanted Saquon Barkley. Whether Maccagnan knew this, or instead took an educated guess, he was ultimately vindicated. As it pertained to the quarterback market, the three spot was really the number two spot. For the Jets, this meant that either Darnold or Rosen would be available — assuming, of course, everything went to plan. The most heinous crime Maccagnan can be accused of is taking a gamble in making the deal with the Colts. He cannot be accused of trading up without a plan. The lack of faith Maccagnan was shown is in many ways understandable. With the exceptions of Jamal Adams and Leonard Williams, the Jets front office has struggled to identify and select sure-fire talent in the draft. This reality has been most evident in the quarterback market following the woeful selections of Bryce Petty and Christian Hackenberg. If league observers doubted the lucidity of the Indianapolis trade, much of that falls on Maccagnan. This was his moment to prove the league wrong, and he grabbed it with both hands. Maccagnan’s high stakes chess move stands in stark contrast to Cleveland’s blunder. Armed with the first and fourth overall picks, this was supposed to be a slam-dunk draft night for an organisation in desperate need of some solidity under center. Instead, Cleveland opted for a quarterback who brings with him ample baggage and uncertainty. Although we, at Onside View, dismissed the comparisons between Mayfield and former Cleveland-failure, Johnny Manziel, there are nonetheless a number of major concerns that accompany the Heisman Trophy winner. Taken in isolation, Mayfield’s height, off-field attitude, and college offensive system (as well as mediocre college competition) might not be major sources of concern, but when taken together, they amount to a substantial case against the Oklahoma prospect. This isn’t to say that Mayfield cannot be a success in the league (there is a good chance he will), but he has a number of hurdles to overcome. The questions, then, are twofold: Is Cleveland the right place for him to develop? And is he ready to start under-center soon? In their own ways, both the Jets and Browns GMs took risks. The difference, however, between Maccagnan and John Dorsey is that the former was forced into making his high-risk play in the form of the Colts trade. Dorsey, by contrast, was blessed with the luxury of selecting from every available quarterback, and passed on both Darnold and Rosen — the “safest” choices open to him. If Cleveland have in fact made an error in selecting Mayfield, Head Coach, Hue Jackson, will have unwittingly elucidated their flawed rationale. “He was”, Jackson told reporters last night, “the best college quarterback this year, by far, in our opinion”. Darnold on the other hand is far a safer choice; an NFL-ready quarterback who is comfortable in the pocket and capable of making any throw and finding his receivers in extremely tight windows. Turnovers are a problem, sure. But with the right coaching, he can work on his ball security and judgement. Something we do know is that Darnold will not bring with him any maturity concerns or worries. He is highly coachable and should work well in Jeremy Bates’ West Coast passing system. While the Mayfield-Bates partnership was being talked-up in the pre-draft build up, we should have been focused on the way in which Darnold is tailor-made for New York’s offense. He has the poise, the precision, and footwork to thrive in a pass-first system. Although many Jets fans talked themselves into Mayfield following the Colts trade, I suspect a majority are waking up this morning with a sense of relief. Baker is the type of hit-or-miss quarterback that organisations like the Browns and Jets cannot afford to gamble on. What Maccagnan has done is provide the Jets with their future. The Patriots have no long term future to speak of at QB; the Bills have taken a disastrous flier on Josh Allen; and the Dolphins are stuck with Ryan Tannehill. Should Darnold live up to his pre-draft billing, the Jets might just be in position to own the AFC East for the foreseeable future. Good morning, Jets fans. It’s okay to pinch yourself.